Happy Holidays everyone! Having trouble thinking of the perfect gift for a loved one? Why not an acoustic guitar? How many people do you know that always say “I always wanted to play the guitar, but never had the time or energy”? Now is your chance to bring music into their lives with a nice new axe they can call their own. But, with the thousands of guitars available today, it can be a pretty complex and confusing ordeal, so Gear Vault is here to help. 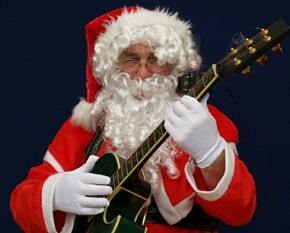 Here are the top 5 selling acoustic guitars for the Holidays. Rogue is one of the few companies, who have answered the call for affordable instruments, while retaining an acceptable level of quality and craftsmanship. When it comes to bang for the buck, these are the guys to call. The Rogue RA-100D is a low end acoustic model, coming in at $80.00, with the standard dreadnought shape, designed for projection and fullness in tone. Its genuine spruce top and bound rosewood fretboard make this guitar easy on the eyes as well. This guitar ships with Martin strings, and features heavy duty die-cast tuners as well, making tuning a breeze, not a chore. And with a 25 ½” scale length, and 20 frets, you can be assured this will get the job done, without too many bells and whistles to worry about later. Also available in black and vintage sunburst, this is the perfect axe for an ambitious beginner, or the seasoned pro looking for an extra 6 strings to play on the go. Not made for arena shows, but perfect and affordable for the average player. Another Dreadnought acoustic, Epiphone is proof that a quality instrument doesn’t have to break the bank, with this guitar costing a mere $99.99. The DR-100 features a select spruce top, a mahogany body and neck, and all chrome hardware. Built with precision construction, the DR-100 is similar to the Rogue RA-100D in many ways, although Rogue does not have the timeless legendary building and sound quality that Epiphone does. The Epiphone DR-100 can be purchased with a natural finish, a gloss black finish, or vintage sunburst. This guitar is especially popular for traveling, because its structure is founded on the idea of clarity and tone, rather than volume. 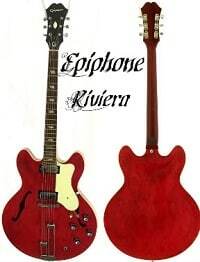 Bargain seekers will also be happy to hear that it ships with Epi strings as well. Bottom Line: Another great choice for the average player, who can sacrifice extraordinary cosmetics. Smaller than standard guitars have been getting a bad rap for quite some time now, being immediately balked at as some sort of child’s play thing, when here’s the truth; they are really fun to play, and perfect for traveling. Mini guitars are not what they seem; their projection is tantamount to that of a full size acoustic, and they can offer a wonderful clear and true tone, no matter the situation. The Taylor GS Mini is really the only way to go when you’re looking for something easy and light to travel with, without losing out on your tone. But just because this guitar is small, that doesn’t mean it can’t be pretty or sturdy. 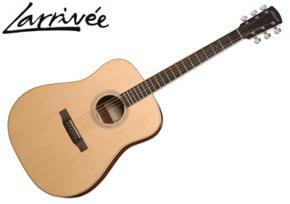 It features a solid Sitka spruce top, Sapele back and sides, and Taylors patented NT ebony neck. Other pleasing aspects of this honey are the Elixir strings that come with it right out of the box, the 3-ring rosette, and its modest price tag, costing about $499.99. So if you’re a Taylor player, you can rest easy knowing this will feel right in your hands, so you can keep on playing, whether you’re in the hotel room, at the venue, or just bumming around the house without skipping a beat. Bottom Line: A great buy, from a trusted manufacturer, for any situation at a reasonable price. Yamaha is another one of those brands that have taken a beating in reputation the last 10 years or so, being one of those brands that many have considered novelty and cheap. But in recent years, Yamaha has staked their claim in the market as a serious, high quality brand. However, they never forgot about the little guy, keeping a formidable lower end line that the average working man can afford, while keeping the lights on at the same time. The crown jewel of their lower end models, the Yamaha F335, has something to say about budget guitars, and it is bound to be heard. It’s dreadnought body is fabricated with a laminated spruce top, and meranti back and sides, with rosewood bring up the rear for the fingerboard and bridge. Dazzling gold die-cast tuners, and a tortoise shell pickguard also give this guitar a special charm that is a fresh break from the norm on a standard dreadnought acoustic. And with a price of $150.00, this just might be what you’ve been looking for: a handy, strong axe that isn’t bargain basement, but isn’t top of the line either. Bottom Line: A nice middle-of-the-road guitar that isn’t bottom dollar, but wont hold your next rent check either. You saw it coming—the big dog acoustic that everyone wants, but seldom can afford. Yes folks, it’s from our old friend Martin, and its coming full force. The Martin HD-28 delivers a countless number of goodies that will please even the hardest person to shop for during the most wonderful time of the year. Sure, it has a high price, but you know full well by now that Martin always charges high prices, but returns even higher quality. 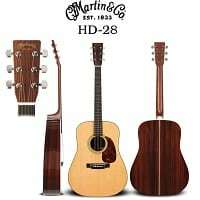 The Martin HD-28 has all the foundational basics that make up a typical dreadnought; Sitka spruce top, rosewood back and sides, a mahogany neck with an ebony fretboard. But, as with many other things, it’s the little things that count. Things like the Herringbone top trim, the traditional zig-zag backstrip, and of course the famed x-bracing that allows the sound to pour out freely and spill out over everything in the room. Bottom Line: It’s not super friendly to the wallet with a price of $2,599.99, but it will fulfill every promise Martin has ever made to its loyal player base and much more. Presentation may not be everything but with a Mahogany body and neck, chrome hardware, and not to mention the all-time classic rosewood fretboard, this guitar has a value and character that just can’t be beat. What else would we be discussing here but the family favorite; the Gibson/Epiphone Hummingbird. The solid spruce top, with mahogany back and sides, work well off of the rosewood fretboard, and the chrome hardware and epic Heritage Cherry Sunburst make for an outstanding modernized version of an old time classic. And with a modest price of $349.99, I’d say this one is a no-brainer. 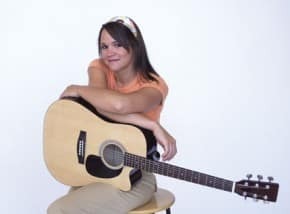 Check out easy acoustic guitar songs listed by Gear Vault! Bottom Line: A legendary guitar at a novice price. Well there it is, folks, all out on the table. With this info you are sure to find the perfect gift for any picker, with a large variety of price options. Who knows? You just might find that you’ll pick one of these babies up for yourself!